This was my second SpiceRoads tour and both times we had a great guide and learned a lot along the way. Best way to see village life in Laos. Lor, our tour guide was fantastic. Venture beyond Luang Prabang to the countryside and discover the true Laos rich with traditions as you cycle along dirt roads, explore nearby villages and observe the local way of life along the Mekong River. 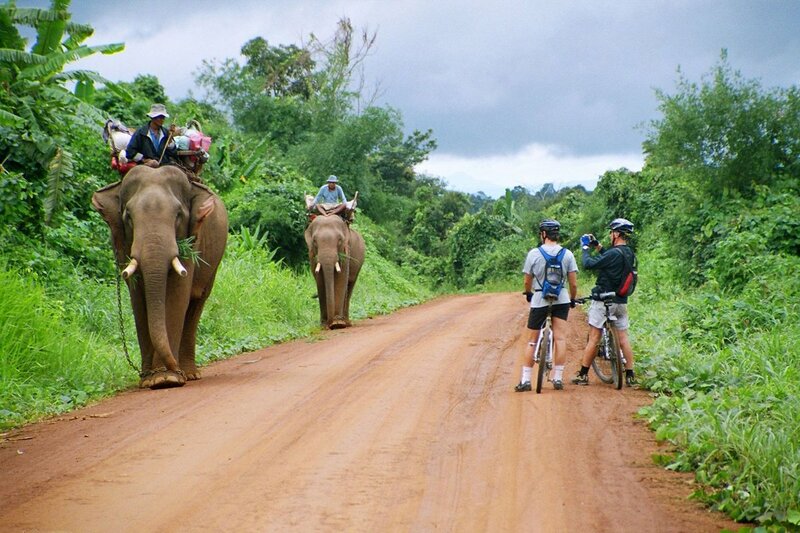 Waving children will greet you as we ride from village to village, absorbing the serenity of Laos. We start our ride by cycling to the Mekong River where we board a ferry to cross the mighty river to Ban Xeng Mean. Here we'll be sharing the dirt roads with oxen, chickens and the occasional motorbike. As we cycle by rice paddies and other fields we'll wave hello to the farmers. We'll also see colourful temples and shrines and there will be plenty of opportunities to take pictures of the surroundings. We will take a break and visit the village of Ban Nakham, popular for producing sugar cane and Kaolam, a local delicacy of sticky rice and beans served in bamboo. Back on the bikes we burn some more calories to build up an appetite for a lunch of local delicacies in Ban Som. After lunch the road changes to a cool and shaded forest trail to reach the Khmu village of Ban Boum, which we will have time to explore. The Khmu are considered the original inhabitants of Laos, migrating into the area from China at least 1,000 years ago, They are now primarily subsistence farmers who still speak their own language. We ride on a dirt road to Ban Jannuau, to see potters crafting intricate pots and jars. We end our tour by crossing the Mekong River and riding back to Luang Prabang in the late afternoon after a busy day of exploring. We ride for around 5 hours and complete 37 kilometres in total, from morning until the late afternoon, which is ample time to explore the scenery and provide insight into the Laos way of life.